While gold prices have reached nearly a 7-week low amidst positive U.S. jobs data, on March 10, the U.S. Mint re-launched the American Platinum Eagle coin and sold 10,000 ounces of them in just three weeks. Also in March, platinum prices went up by about 1% while gold’s price fell by 3%. 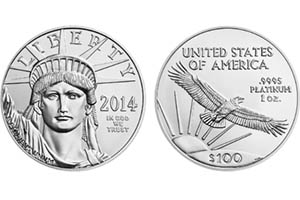 The Platinum American Eagle had been discontinued back in 2008 due to low demand. Roy Friedman, executive vice president at major U.S. coin wholesaler Dillon Gage, believes “The outright platinum market has actually been performing better than gold and silver, and that has helped attract some investors to the physical platinum market.” Dealers think the quick selling of the coin shortly after its release reflects high demand set off by concern over future supply from South Africa, the top-producing country for platinum. The South African mining industry recently suffered through a two-month long strike. Platinum is heavily used in the auto industry, so investors hope growth in the global economy will stimulate that industry and up the demand for platinum worldwide. While platinum coins have been selling well, demand for gold coins has recently fallen. Coin sales tend to be seasonal, performing best at the beginning of a new year as investors and collectors seek out the most newly-minted coins. American Bullion specializes in adding physical platinum to your retirement portfolio in addition to gold, silver, and palladium. In 1997, Congress passed the Taxpayer Relief Act which allowed platinum bullion meeting minimum purity requirements to be approved into precious metal IRAs. Owning platinum in a self-directed IRA can help investors diversify their holdings. To learn more about your options for adding platinum to your retirement account, call 1-800-326-9598 and speak with a precious metals specialist.